I-87017DW is a serial interface and 8-channel Differential/16-channel Single-Ended analog input module. 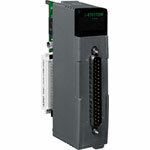 The analog input range is software selectable and supports +/-10V, +/-5V, +/-1V, +/-500mV, +/-150mV, and +/-20mA. Differential and Single-ended mode is selected by jumpers. ESD Protection 4 kV Contact for each terminal.